The houses are one of a kind, lining the streets along the water canals that are crossed by more than a thousand bridges. Some of the bridges are plain, the others are spectacular, all are romantic, especially when lit up at night. 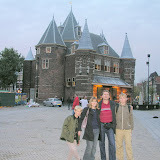 We visited the Van Gog Museum and Anne Frank Museum, but there are many more worth a visit.